I use the word illusive since he doesn’t really clarify what this means. Is this AWARE II, surely not as that is well under way now. Are these sub-studies of AWARE II? Are they completely new studies, and if so how will they differ? Anyway, hopefully we will learn more before long. Makes me think he has something becausethis looks really expansive. AWARE II is, technically, a single study being conducted in several sites. A “series of studies” seems… Broader? Agree with both comments. These must be new studies, and it may well be that they are a follow up to data that will be coming out of the AWARE II study when it is published in 2020. The implication would be that something happens, and that if it were just zero consciousness, why bother studying it? I am looking at a much simpler paper. It was recieved in October 17 online in December and in print about Feb 18. So for an early 2020 he must be ready to submit in about a year and if he must have the raw data by now and that would explain the hiring…it must be for the expansion. “We won’t end the study until September 2020 and will only then analyze the data. He’s very clear in the email that there will be no more leakage, and that they want a full dataset etc. However, does that mean he doesn’t know some results already…heck no! Does that mean that we aren’t allowed to speculate on those results, and the implications of his recent announcement…again, of course we can. Basically from the point he started ramping up recruitment and doing the rounds of television studios being much more assertive in his position on the nature of consciousness after death, I am utterly convinced he has one hit, and possibly more. My concern is that AWARE II is suffering from a thing called “scope creep”. This announcement is either regarding new studies or that AWARE II is either morphing into something different, or has been shelved/cut short. Think another email might be in order, although he is unlikely to tell me anything that is not in public domain, but clarification on whether AWARE II is still ongoing would be good. The fact that they were recruiting for AWARE II a couple of years ago, and in the email to me is saying “going to launch” in 2018 is very confusing. New email will be going out tonight! I thought he had 300 recruits already https://twitter.com/SamParniaMDPhD/status/929153480618586112. Can you ask him if those 300 recruits meant 300 who survived cardiac arrest and were interviewed? Those were the inclusion criteria, so i would assume so. I would expect that by now they would be near the half way point in terms of recruitment given the patient recruitment activities they initiated last year (I have been doing this recently for a GvHD study that was suffering from poor recruitment, and will be doing it in my next job back in the UK). I’m just confused by the apparent contradictions in the statements. Firstly he’s saying that AWARE II is ongoing with a planned completion in 2020, then he’s saying they are going to launch it in mid 2018…which is why I have asked for clarification specifying exactly what is going on. Maybe it refers to the addition of new centers, or maybe they had a surge of hits in recent months and have decided they have enough data from AWARE II to meet their “endpoints”, and wish to conduct new studies to further elucidate exactly what is going on, rather than knowing that it is going on. Anyway, hopefully he will send a quick email to let help us clear this up. Is the AWARE study all starting over again, or being integrated into something else? It reads like expansion to me. Perhaps other people and funding are a factor. At the end of the day, the AWARE study raises multiple issues that could specialist to varying contributors / analysts. I hope you are right NT, and yes, positive hits from AWARE II will generate more questions than answers, and will cause an explosion in research on this subject. Only makes sense for Dr Parnia to get ahead of the curve and assert his position as the preeminent researcher in this area. This really seems like something new. Aware was not really exploring what happens it was just looking for confirmation if anything at all happens…the hits….He hinted at this before when he made some bold statements about a consciousness field……..I will be really interested because in all honesty I have no idea what you would do beyond confirming a hit. …..That makes me think they really found something. I think (but I don’t know of course) that this may be related to a new and additional experiment which he has previously alluded to. I’ve copied this post which I made on a psi forum about the tweets. This may be about the experimental tests I believe they are conducting on cardiac arrest patients (in addition to the OBE visual component and the level of oxygen depletion in the brain) whereby they are introducing sounds into the ears after the heart has stopped to help to determine and pin down once and for all the precise capabilities (or rather lack of) of brains after cardiac arrest. Assuming the ears are plugged with this sound and the patient doesn’t hear it, but reports external sounds, such as doctors saying very specific things during the resuscitation, then that means there was something else other than the patient’s brain that was receiving the information, hence the psyche, separate consciousness. The funding he’s got recently has enabled him to ‘go to town’ somewhat on this, I would imagine. But once again, I might be wrong. As to the state of Aware 2 and what they might have in the way of hits, your guess is as good as mine. I’m convinced they’ll get hits sooner or later, it’s just a matter of patience. But if what I think Parnia is up to with the ear stimulus bears fruit… then that is also going to be pretty hard to explain away for materialists. Am I missing what this could mean? – Additional studies regarding consciousness and NDE´s, as a result of positive hits. – Additional studies regarding methods to enhance oxygen delivery during CPR or other methods regarding issues not related directly to consciousness and NDE´s. – The start of the NDE´s and consciousness aspect of the study and perhaps the end of studies not related directly to them. – The start of the entire study. This seems unlikely because of the announcment of 300 recruits but likely because they wanted researchers not long ago. Sam is doing something great but he does not/can not focus entirely on the NDE aspect and that means we have to wait for years to know what happens after life. I understand and do not blame him if the study is postponed but if it is then I will look into the possibility of initiating another study. For example, one camera records the entire resuscitation room (except for patient to avoid ethical issues) and another camera records the EEG machine. Both have synchronized clocks that show how much time have passed, so it is possible to tell which recorded scenes correspond and if there was no brain activity present during the patients observation outside of the body. – Rules out mistakes or cheating because the original live scenes can be saved automatically to a cloud so one can recognize any post editing. I remember Woerlee said something about cardiac massage giving enough blood to the brain that it might let it hallucinate during cardiac arrest. This is something I accidently ignored before, during cardiac arrest the CPR might give enough blood to sustain hallucinations. The only problem with this theory is the lack of dizziness/confusion in NDEs, but otherwise I feel its quite threatening. Will Parnia just tell us something already? Hi chad. However in additions ndes and the like like shared death happen in all brain States. In addition not all caridac arrests have cpr etc. I don’t know of many come back from cardiac arrest without CPR of indeed any. Chad. Parnia explained that strange case well I thought. His research has shown cpr does not provide enough blood to get nerve cells to communicate. It just keeps tuem from dying. Z I would call that one a hit. Out of the park. I like how he releases his reults through job ads. Parnias research with eeg has shown the opposite. This link does not show any eeg …….I am sure Ben can add some more. Oh Panias audio hit I think occured when there was mo brain activity. Joffrey, I wonder, does your ref. correlate with this paper (2012). Carhart-Harris is co-author on both papers. So less activity is more cognition? Does DMT (the paper you ref.) also quieten the brain down? So in the ultimate state of a true NDE where there is no blood flow in the cardiac arrest model, tremendous cognition occurs. So are both papers kind of “on the way” to confirming that NDEs as something extraordinary and not having an ordinary explanation? He’s bound to have had at least 1 OBE by now right? There’s no way the OBEr can miss the target this time, it’s right next to their body. So since he’s still supportive of this, he must of had a hit? Otherwise if the OBEr didn’t see the target he’ll know it’s a hallucination. Sorry for my absence. I have been moving country this past week, (Canada to UK) lost WiFi in my house before I left, and have had some family tragedies. Firstly Z, thanks for posting that link to Parnia‘s latest TV appearance. It definitely points to his sitting on some more significant data than “seeing the colour of someone tie”. I find the DMT thing interesting, but take David’s point about cautioning anything that comes out Frontiers. However, if the brain is a “receiver” like a TV set, then it is quite possible that certain mind altering drugs may indeed be able to temporarily “detach” the conscious from the brain, and that rather than that research being evidence that the NDE is a subjective natural experience, it could actually support the idea that the conscious is a separate entity. Having said that I haven’t read the whole article yet, but will. Finally my book on the origins of life is nearly ready, and I will be letting you all know when it will be available. It is a subject that is actually much more closely aligned with my area of scientific expertise. You will also learn my real name! I will see what I can do with windows media! I will also be producing some Youtube videos. I believe that the origin of life and nature of consciousness are two of the most important questions regarding who we are and whether there is a “God”. Looking forward to it Ben. That is more mine as well…..hope all is getting better. Ever read any of Stuart Kauffmans work. I had a seminar on his work. Agree on Parnia. Hi David, I haven’t really come across him much as he is post origin of DNA, and is more focused on genetics. He is never cited in the material I review which is very up to date. My area of focus is entirely on the likelihood of the DNA code appearing by random natural processes. This is the central question around the origin of life. There is currently no answer to this question, and no viable theory. He was stymied like our seminar on the chicken and egg on how a basic metabolic system could arise independant of the coding. ….. The good old chicken and egg. I have a section in my book tilted: “The chicken and egg problem – it’s old, but is it rotten?” My book is very focused on DNA and the translation system, although I do briefly touch on metabolism first vs genetics first etc. It is very interesting that leading researchers in the field accept that they are no closer to explanaining how we get to LUCA than we were back in the fifties when DNA was first discovered. Yeah I think he has more than ties because he was saying the brain is a type of receiver. I would think he must have something to go out on that limb. One of the DMT paper authors doesn’t think much of Dr. Eben Alexander’s famous experience. But, I wonder, has he really looked at all the fine details? Also Dr. Ray Moody is quoted. In the BBC article they say 30 volunteers were tested but in the DMT paper the number is 13. Also shared-death experiences are not covered. And, as I’ve read, how can a hallucinating brain on DMT be compared to a brain not functioning during cardiac arrest (but the person has an NDE)? And when one author says … “There is nothing here to begin to enable us to propose that on DMT, you literally transcend the laws of this universe and do actually go to another world,” doesn’t this imply actual NDEs could be really different? I mean, people do say they experience “another world” sometimes. I ignore the BBC as they are an organisation driven by a left-wing atheist ideology. This study says nothing about NDEs at all…nothing. What it says is that drugs that affect neurological processes alter the users experience of consciousness. They may be mimicking a deep meditative state, and they may indeed be separating their conscious from the brain for brief moments, but because their hearts kept beating, they were not in a Near Death state. I am now proof reading my book on the origins of life, and I talk at length about the establishment’s relentless focus on trying to show that everything has a materialistic explanation and that there is no “soul” or God. The BBC are the very worst for this. Hi Ben, I kind of agree about the BBC, like everything is wrapped up materialistically. But I did spot this interview with Eben. I vaguely remembered it and googled “eben alexander” bbc! I do think the original article is worth a full post actually as it insidious and needs to be rebuffed properly. I will try to put some time aside this week. So, the markers that are fundamental and specific for both experiences all have a large or medium difference but they are saying that the experiences mimic each other and that there is no significant difference because the other markers had small differences, despite that those markers are common in many drug experiences and not specific for either of these experiences (except for seeing a bright light). I wonder when Dr.Parnia will give us an update. He wrote in the coming weeks but 10 weeks have now passed. He’s still talking about aware 1. Why won’t he say anything about the pictures? The only serious evidence for this is if they perceive something a fully conscious person in their position can’t perceive it. I feel nervous, because he said he’s doing hidden picture tests but only said they could hear sounds. But then again he knows all the skeptic arguments better than all of us, if someone said they heard sound but didn’t see the picture he would be calling them hallucinations. I’m beginning to hate him now. Yep, I think there’s some conflation of AWARE I and AWARE II in that video clip. The methodology he describes is for AWARE II, but the results are from AWARE I. Also, I personally don’t think that audio results are going to convince even soft sceptics…the visual hits are what are needed. Certainly gives more detail on methodology in this short video excerpt than we have learned before. That is because they dont understand that audio is as complex as video. True belivers on anything never change their minds. The skepics are not true skeptics . They have a belief sysyem as hard wired as the Christians they despise. I am a classical show me evidence and mire evidence and you have my attention It was the A 1 audio that got my attention. Then Parnis work on brain shutdown which is so comprehensive I can only conclude something is going on. That defense of A1 and classical scepticism aside since this is recent I don’t think he would make such statements unless A2 is even better. I agree with David. Firstly, audio when the EEG is flatlining should be as valid as video…but I can see why the video will shift the fence sitters where the audio won’t. Secondly, yes, he would be focusing on other things if A2 wasn’t producing results. When do u think Parnia will anounce results about aware 2? It’s interesting to see the “kerfuffle” (understandably so) that Parnia causes when he lends his time and expertise on this subject. I would just caution everyone once again to be patient and remember how incredibly challenging this is for him and his team. This research is in it’s relative infancy and even though more than forty years have past (since I got the bug) it’s still going to take at least one to two, maybe even three decades more (who can possibly know ? it’s all guesswork), even after the current study is completed (Aware 2) to gather enough evidence to sway the argument once and for all. 1500 recruited into the study should produce between 150-300 with NDE if my feeble mind is working correctly. That should (depending on which previous studies we look to) give us about 30-60 (at the very best) out of body experiences but of course not all of these will be positioned directly above the target tablet on the pole. Some people describe immediately going backwards through the wall or up through the ceiling, not paying any attention to what is going on in the room. It’s tantalising to wonder when the detached consciousness/spirit of some “Joe Soap” in cardiac arrest will finally look down, notice the picture, be successfully revived, remember it and stay alive long enough to tell the study interviewer. By anyone’s standard, that is an extremely difficult experiment to carry out. When that happens the ideological debunkers will immediately go after the methodology or any alternative explanation, including contamination and outright fraud to try to discount it. More funding and more studies will follow and what has been learnt will be used to fine tune ever more ingenious contraptions and so on and so forth. Why do you keep telling people not to expect much? If he doesn’t get hidden targets this time, NDEs are proven to be hallucinations, because there’s no way an OBEr can miss the target this time. Can you not accept there’s a possibility they are hallucinations? Unless you’ve had a irrefutable veridical perception urself… You sound like you have a prior dogma that cannot be challenged, just like the pseudo skeptics who try endlessly to insult and debunk NDE research. So… What’s with the childish diatribe? “hallucinations” … but how can you hallucinate when there’s no brain blood flow? I’ve heard several times this is medically not possible. Chad said > Why do you keep telling people not to expect much? If he doesn’t get hidden targets this time, NDEs are proven to be hallucinations, because there’s no way an OBEr can miss the target this time. Your post was aggressive and rude but I’ll respond anyway because I’m used to dealing with angry people. You don’t seem to comprehend how difficult this experiment is. You say there’s no way an OBEr can miss the target this time? That’s just an unfounded, sweeping assumption! These patients having an ‘out of body experience’ don’t know they’re are supposed to be looking for a target. They are much more likely, based on what we’ve already learnt, to be interested in their own bodies… or what their relatives are doing out in the corridor. There is no specific motivation for anyone to take notice of anything in particular…they may do or they many not. Parnia is hoping that one of them eventually WILL spot it… if… they are in the correct position, but we just have to wait and see. If over the course of many years of experimentation, NOBODY sees the target, that will mean that the methodology of the experiment has failed. However, if the patients are also able to report exactly what went on in the room in detail… when they were clinically dead, then it cannot be a hallucination. “Something” not dependent on the body/brain, must be doing the observing…there is no other explanation, because the brain doesn’t work in cardiac arrest after 15 seconds. So, no, I cannot accept that veridical out of body experiences are hallucinations. A hallucination is a perception of something that does not correspond to reality. I wasn’t trying to be rude, I’m just saying proponents should be very cautious due to the nature of the claim. I’ve seen you post a lot and u’re obviously a big time proponent, yet you are 100% sure they are real when not even Greyson is 100% sure. And the pole is placed right next to their bodies, they will see it in their peripheral vision and wonder why there’s something so strange in the OR, so i really dont think they’ll miss it. Obviously everyone heres biggest wish is for NDEs to be real, but extraordinary claim require extraordinary evidence, and it doesn’t make sense to me why we should be suffering in this world when the beings of light can just snap a finger and give us fake life time memories to make us learn whatever we’re supposed to learn in this world. You are assuming that “vision” and focus works the same under these circumstances, it most likely doesn’t. And peripheral vision in particular is a direct product of the eye’s biology, in particular its shape. So, unless there is an “etheric body” the mimics all of biology’s redundancies, it seems unlikely. Preliminary results may be published in 2020, but I’m willing to bet that if the study wraps up then, the peer reviewed paper will come out in 2021. Science moves slowly. Bottom line we don’t know whether the earth will even exist in 2020! Personally, I would put money on there being a few hits published or presented in 2021, but as Tim points out, this would not sway the hardened skeptics…pretty much nothing will. It is those in the middle who are curious, but who have been convinced by a generally atheistic sceptical media that it is the result of some natural process, that may be swayed. There is good research that has been conducted in Stanford in the 70s that shows that once a belief has become ingrained, then even facts won’t change the view of that individual. To Chad’s comments. A lack of hits would not prove that NDEs are hallucinations, but it would add weight to that theory, and harden the atheist establishment position. Yes, I agree, Ben. Just to deal with the often asserted falsehood that CPR generates enough blood flow to the brain during cardiac arrest, it does not. Gerry Woerlee relies on this assumption to make his case for a materialistic explanation for veridical OBE/NDE’s. He has been refuted many times by Pim Van Lommel and Sam Parnia but because of his ideology, continues regardless. Monitoring of the electrical activity of the cortex (EEG) has shown that the first ischemic changes during induced cardiac arrest in humans are detected an average of 6.5 seconds after circulatory arrest. Ischemic changes in the EEG show a decrease of power in fast activity and in delta activity and an increase of slow delta I activity, sometimes also an increase in amplitude of theta activity, progressively and ultimately declining to iso-electricity. But more often initial slowing and attenuation of the EEG waves is the first sign of cerebral ischemia. With prolongation of the cerebral ischemia, progression to a flat-line EEG always occurs within 10 to 20 (mean 15) seconds from the onset of cardiac arrest (De Vries et al.1998, Clute at al., 1990, Losasso et al. 1992, Parnia and Fenwick 2002), and the EEG remains flat during the cardiac arrest until cardiac output has been restored by defibrillation (Fisher et al. 1996, Marshall et al 2001). Any OBEr will be in a position to see the target, so if they can’t see the target then it’s proven to be hallucinations. And for the no blood flow thing, the debate is when the NDE/OBE occurred, skeptics say it occurs just before or after the heart starts beating again. The audio perception in aware 1 happened in a period of no blood flow, but nurses might have accidently told the patient what happened, the patient wasn’t interviewed straight after waking up, he was interviewed 1 year later. Also in some cases CPR gives enough blood flow for full consciousness (somebody posted a link before). This is why it’s futile to discuss veridical perception that’s not a double blind hidden target, because you can never be sure if the person is conscious or not. I sort of agree with Chad. If a tablet is held directly above the patiënt, then they normally can’t miss it, if their consciousness really left their body. Because their body is the first thing they tend to see during NDE. Of course it is possible that they don’t remember everything afterwards. But there should normally be at least a few hits if there is something to this. If there are no hits, then I would also be inclined to think that NDE’s have a materialistic explanation, but that doesn’t mean I could never be convinced otherwise, if the evidence is there. I am keeping an open mind on this. Unfortunately that doesn’t necessarily follow. You are still left with the problem of explaining how patients in cardiac arrest can describe what is occurring around them, sometimes what is occurring out in the hallway. NDE’s also consist of a lot more than just out of body experiences. What about paranormal knowledge gained during the NDE such as discovering a close family member has died while you were in hospital and you hadn’t been told about it but you wake up and possess the information ? yes if NDEs are hallucinations it’s also very difficult to explain cases like pam reynolds, e.g. she felt her NDE was continuous but her brain was dead midway so one has to accept her brain continued the NDE after it was restarted, a very bizarre thing to accept. And no CA NDEr ever reported feeling dizzy, a necessary feeling with lack of oxygen. But the claim of afterlife is VERY extraordinary, and a rational person would rather go with highly unlikely materialist explanation until multiple double blind hidden target verifications by independent teams with credible researchers are made. As for close family members dying, I don’t consider them very convincing, because of the file drawer effect, we dream about things happening to close people all the time. Tim can i ask you this, are you so confident about this you’ll bet your life on it? It’s so easy to just talk about things you believe in, but if you want to bet on something like bitcoin, that has serious consequences, it all changes yes? The level of evidence required goes up exponentially compared to just talking about things you believe in. They will explain it through the incredible brain function during ca Tim. Also there is no eeg during cpr….not enough blood flow. Parnis previous research. Indeed. It has to be brain function. Chad said >Tim can i ask you this, are you so confident about this you’ll bet your life on it? It’s so easy to just talk about things you believe in, but if you want to bet on something like bitcoin, that has serious consequences, it all changes yes? The level of evidence required goes up exponentially compared to just talking about things you believe in. You seem to be suffering from some kind chronic desperation/anxiety syndrome about this research for some reason best known to yourself. It seems to be ALL or NOTHING for you. No one sees the pictures, Caramba…that’s it ! Thousands of intriguing/reliable testimonies and more than forty years of meticulously carried out NDE research MUST be immediately confined to the dust bin. And no, I don’t just “talk” about “things” I believe in, I examine the research (over decades). I speak to people who have had cardiac arrest/ NDE’s. I have seen that kind of “all or nothing” attitude before… In severely depressed and potentially suicidal people. In their case it’s usually about religion and salvation -not science- but the symptoms ring a bell. I think that now that Google makes this sort of research better known, we can expect that people to gather around it, in pages like this one. I’m not saying that is necessarily Chad’s case, but he does seem extraordinarily invested in the result. While I believe the same as David, I am inclined to agree with Chad’s view of how the evidence could be interpreted. Without a few validated OBEs, skeptics, or even fence sitters, will never accept that NDEs are real. For me the auditory validations don’t carry the same weight as potential visual validations. The fact is that people could envisage how someone might have heard something, while not understanding that their brain could not have received the data. However, no one could envisage how someone could see something while their eyes are closed and they are unconscious…and yes, just one, or even two visually confirmed OBEs would not be enough to silence accusations of meddling with the study and potential dishonesty. On the other side, if there is a sufficient number of visually confirmed OBEs, then Chad makes the point about accepting the whole afterlife aspect of NDEs. This is something we will never be able to prove, but corroboration of numerous accounts combined with confirmed OBEs should make people really sit up and reconsider things. On the other hand, faith will no longer require faith. Okay, point taken, Ben but Chad was basically demanding that I accept that these experiences might be hallucinations. And I can’t (now) accept that…because they don’t fit the criteria for hallucinations. A hallucination is the perception of something that has no basis in reality. Sabom’s patients for example were able to describe in detail the specific medical procedures that were carried out on them when they were unconsciousness/clinically dead. We have hundreds of these cases now and what they report is not hallucinatory, it is factual real time reality. The patients themselves report making the observations from a position out and away from their body. If this phenomenon is not consciousness separating from the body, then science is going to have to come up with some other explanation, but hallucination and confabulation it ain’t. You will never convince the Chads of the world because their faith is as strong as those they cant stand. I am very faithless. I like evidence and since I have published on Biology and Philosophy I have some knowledge. Parnis studies are realky good compared to most stuff tgat gets published. Also Parnias confidence is pretty remarkable. OK, so I am a scientist who is engaged in discussions every day in which I use data to present a position. The key is about being BALANCED. Tim, and David (Alan when he’s around), we all believe the same thing pretty much. However, if we are to be balanced then we must accept that the data could be interpreted in a different way. When Chad says MIGHT be hallucinations…I agree, to a point…but is it LIKELY they are hallucinations given what we know about hallucinations? No it is extremely unlikely. However, to be balanced, in the absence of conclusive evidence stating otherwise, we must allow for an unlikely explanation…to do otherwise is unscientific. Just to add…when I say unlikely, I do not include impossible. Seeing an image projected above your head when you are unconscious and your eyes are closed is not possible by natural means. We agree on science but disagree on religion so it is about science here. I guess that applies to Ben I have no idea about Tim or Parnia for that matter. Here the video with Sam parnia. The full one. Fast forward to 21 minutes or so. Please note it looks like it predated the today one I posted earlier as it looks like be working at stony brook at the time and is now I think working in langore. So may have been taped start of year or so. Thanks Z, very interesting, good job ! The DMT promoters have a grudge against NDEs. 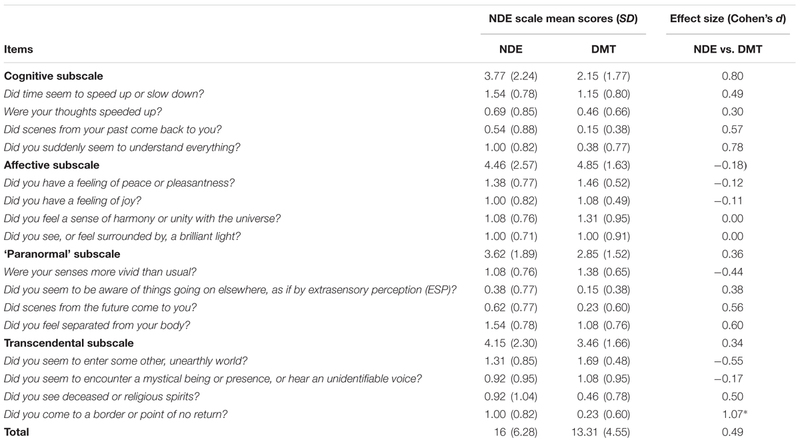 Anyone who read 10 NDEs vs 10 DMT trips will know they are VERY different. Feeling of peace joy/other worldly environment/bright light, lol i often dream those things, so according to these guys my brain is pumped with DMT when im dreaming. It’s amazing the level of dedications these guys have in trying to debunk NDEs. But you should remember just how much hate Planck received when he proposed a way to resolve the black body radiation problem, because it was too bizarre for the hard cases to consider as a possibility. What I am scared by though is the tight correlation between brain and consciousness, blind sight, loss of ability to recognize faces, huge change in personality after brain damage, emotions being completely determined by neurotransmitters, etc. These are the things a good skeptic use to argue against NDEs, not DMT/lack of oxygen nonsense. Proving or debunking that claim can be as simple as giving a dose of DMT to actual NDErs. They didn’t, as far as I can tell. I was gonna say the same thing, there surely is somebody out there who had an NDE and has taken DMT right?